Mechanically Operated, Height Adjustable. Back-Rest & Knee Rest, Trendelenburg / Reverse Trendelenburg Positions by Screw System. Uniformly Perforated 1.2 mm Four Sectional CRCA Sheet Top,Trolley Type Base and main Frame Made of Strong.Rectangular CRCA Pipe.S.S laminated head & leg bows. 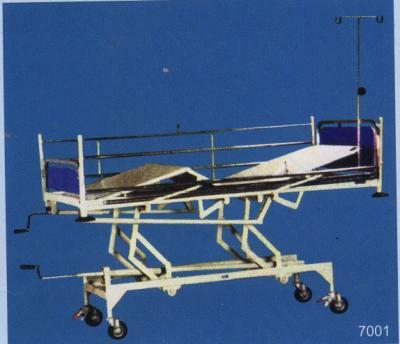 S.S. Full Length S.S Collapsible telescopic Side Railings, One telescopic S.S.I.V. Rod Height Adjustable. Four Revolving Corner Buffers Bed Mounted on 150 M.M. Dia Castors, Two with Brakes Location Provide for I.V. Rod.